(Tempe, Arizona–March 12, 2018) Imagine a year in Africa that summer never arrives. The sky takes on a gray hue during the day and glows red at night. Flowers do not bloom. Trees die in the winter. Large mammals like antelope become thin, starve and provide little fat to the predators (carnivores and human hunters) that depend on them. Then, this same disheartening cycle repeats itself, year after year. This is a picture of life on earth after the eruption of the super-volcano, Mount Toba in Indonesia, about 74,000 years ago. 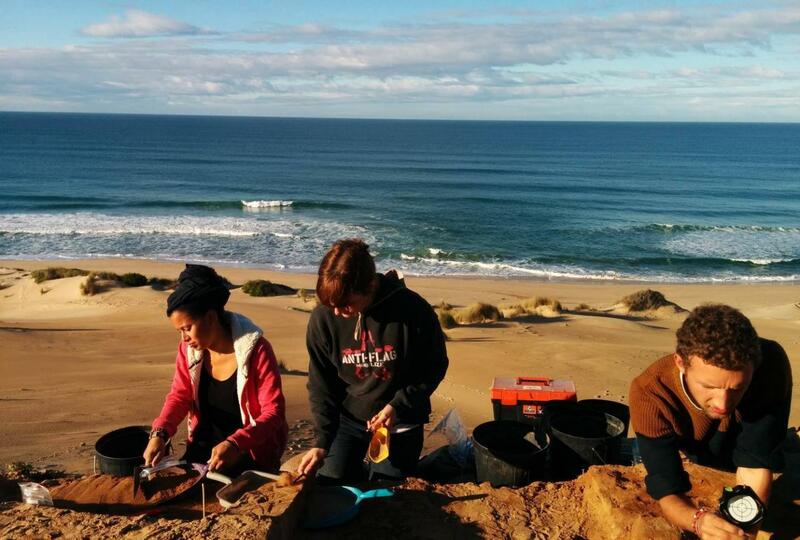 In a paper published this week in Nature, scientists show that early modern humans on the coast of South Africa thrived through this event. Cleghorn explains, "We collected a long column of samples – digging out a small amount of sediment from the wall of our previous excavation. Each time we collected a sample, we shot its position with the total station. We could then precisely compare the position of the sample to our excavated cultural remains – the trash ancient humans left at the site. We could also compare our cryptotephra sample position with that of samples taken for dating and environmental analyses." 1Department of Geoscience, University of Nevada Las Vegas, 4505 Maryland Parkway, Las Vegas, Nevada 89154, USA. 2ARC Centre of Excellence for Australian Biodiversity and Heritage & Centre for Archaeological Science, School of Earth and Environmental Sciences, University of Wollongong, New South Wales 2522, Australia. 3Institute of Human Origins, School of Human Evolution and Social Change, PO Box 872402, Arizona State University, Tempe, AZ 85287-2402, USA. 4African Centre for Coastal Palaeoscience, Nelson Mandela University, Port Elizabeth, Eastern Cape 6031, South Africa. 5Human Evolution Research Institute, Department of Archaeology, University of Cape Town, Private Bag, Rondebosch 7701, South Africa. 6Malcolm H. Wiener Laboratory for Archaeological Science, American School of Classical Studies, Soudias 54, Athens 10676, Greece. 7Geoscience Consultants LLC, Henderson, NV 89014, USA. 8Department of Sociology and Anthropology, University of Texas Arlington, 701 South Nedderman Drive, Arlington, TX, 76019, USA. 9Department of Geography, University of Cambridge, Downing Place, Cambridge, CB2 3EN, U.K.
10Iziko Museums of South Africa, Queen Victoria Street, Cape Town, PO Box 61, Cape Town, 8000, South Africa.